Houghton Mifflin Harcourt, 9780547330792, 352pp. Hedged in by her parents' genteel country life, she plans her escape to London. There, she takes up with Innes Kent, a magazine editor who wears duck-egg blue ties and introduces her to the thrilling, underground world of bohemian, post-war Soho. She learns to be a reporter, to know art and artists, to embrace her life fully and with a deep love at the center of it. She creates many lives--all of them unconventional. And when she finds herself pregnant, she doesn't hesitate to have the baby on her own terms. 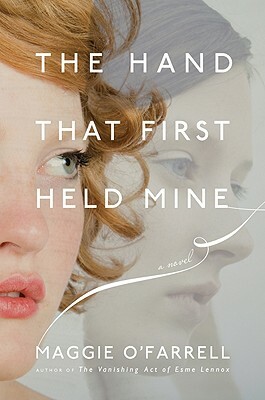 "The Hand That First Held Mine "is a spellbinding novel of two women connected across fifty years by art, love, betrayals, secrets, and motherhood. Like her acclaimed "The Vanishing Act of Esme Lennox," it is a "breathtaking, heart-breaking creation. "*And it is a gorgeous inquiry into the ways we make and unmake our lives, who we know ourselves to be, and how even our most accidental legacies connect us. Discuss the "firsts" referred to in the title. How were Lexie’s beliefs about love and life transformed by Innes? Is there a "first" in your past who changed the course of your life? How did your impressions of Elina and Ted change throughout the novel? What assumptions did you make after reading their opening scene? Describe the different faces of love presented in The Hand That First Held Mine. Which lovers experienced equal affection? Which relationship appealed to you the most? Did you believe Innes’s claim that Gloria had been unfaithful to him, and that Margot was not his biological daughter? Discuss the paintings that became Lexie’s final connection to Innes. What value did they have to Lexie, and to Innes? What value did Margot place on them? What motivated collectors to assign a high financial value to them? How do Elina and Ted each emerge from their periods of instability? To what degree is deception (including self-deception) at the root of their anguish? Discuss the various types of mothering portrayed in the novel. Do Gloria, Margot, Lexie, and Elina share any common ground in their expectations of motherhood? As an artist, did Elina approach motherhood with a different perspective? When Lexie struggles in the waters off the Dorset coast, she can think only of Theo and imagines the milestones he will experience. How did motherhood change her? How did she blend motherhood with her career? What made her a great, if unconventional, mother? What portraits of the world do Lexie and Elina create in their careers? What talents do artists and art critics share? How do the men in Lexie’s life compare to each other? What enabled her to find peace and trust with Robert? Who has the most power in the relationships depicted in The Hand That First Held Mine? Was Innes vulnerable to Lexie, despite her inexperience and youth? What gave Margot power over Felix? How does Elina’s Finnish identity enhance her relationship with Ted? Does it help her to be seen as an outsider? The novel’s epigraph is taken from Matthew Arnold’s poem "Absence," which begins with the lines "In this fair stranger’s eyes of grey / Thine eyes, my love! I see." How does Lexie cope with loss and memory? Is she successful in her attempt to forget? How are fate and revelation woven throughout each of Maggie O’Farrell’s novels, including her best-selling debut, After You’d Gone? What is unique about her portrayal of love in The Hand That First Held Mine?